For the poet, see Ana Blandiana. 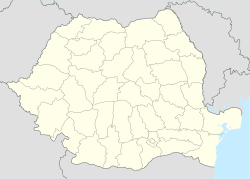 Blandiana (German: Stumpach; Hungarian: Maroskarna) is a commune located in Alba County, Romania. It has a population of 1,187 and is composed of five villages: Acmariu (Akmár), Blandiana, Ibru, Poieni and Răcătău (Rakató). The Romanian Orthodox Church of the Holy Archangels, replacing a wooden church built in 1890. The new church is different from others because of the wooden bell tower. The relatively low nave with a semicircular wooden ceiling extends over the apse. ^ (in Romanian) "Blandiana", at the Erdélyi Magyar Adatbank's Recensământ 2002; Retrieved on April 15, 2016. ^ "Ansicht der orthodoxen Kirche von Blandiana" [View of the Blandiana's Orthodox Church] (in German). Archived from the original on 14 December 2009. Retrieved 14 January 2010. Wikimedia Commons has media related to Blandiana, Alba. This Alba County location article is a stub. You can help Wikipedia by expanding it. This page was last edited on 21 January 2019, at 17:50 (UTC).